Continuing on from my trip report for Day 7 – I Can Show You The World here is our journey around Morocco! 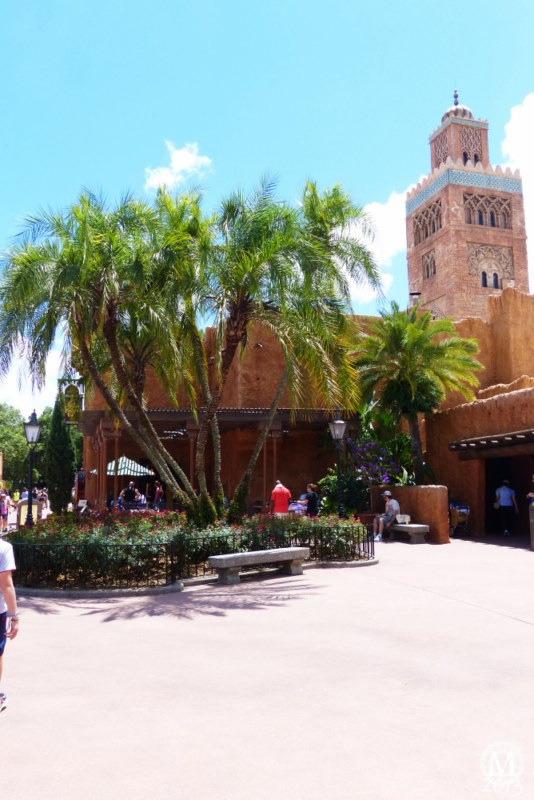 I really enjoyed walking through the Morocco pavilion, I love the architecture and the general feel of the place. May be the closest I get to going to the country itself! And that’s one of the reasons why I love Epcot World Showcase. I liked how it felt that you were walking around the souks of Marrakech, every where you seem to turn are shops selling stuff! A fab eclectic mix of Moroccon goods – belly dancing costumes, jewellery, lamps, knick-knacks – a great place just to have a look around! Oh, and you can’t stop by Morocco and not wear a fez! We noticed that Aladdin and Jasmine were doing a meet and greet at Lamps of Wonder. We were there just before the end of the time slot, but were not allowed in to see them! She said you have to turn up half an hour before the time slot…annoying! We later found out that our friends were inside meeting them and they were surprised we weren’t allowed in! By now Liam said he was hungry, and to be fair, so was I! Ice-cream for breakfast had been worked off with the walking! We stopped by Tangerine Café and ordered a portion of chips for him and I had a tiny portion of tabouleh. To be fair, it is a side dish, but I only wanted a little something savoury – plus we did have our Biergarten ADR later in the day. I don’t seem to have a receipt for this food stop, so no idea how much it cost. The tabouleh was really nice – fresh, herby and lemony. I really enjoyed it, and hope we get to eat properly in Morocco on our next visit!